1962: First season finishes 5-9-1 under coach Luther Schwich (1962-64), also the college’s first athletic director and basketball coach. In three baseball seasons, he compiles a 34-33-1 record. 1962: Jim Huchthausen wins CLC’s first Outstanding Player team award. Among his highlights: a seven-RBI game. 1965: Legendary football coach Bob Shoup takes the reins of the baseball program for one year; he is followed for the next two seasons by Ron Mulder. 1967: Three-sport star Al Kempfert pitches a one-hitter against Cal Western and a two-hitter against Pepperdine. 1968: Richard Papenfuss coaches for one season and George Engdahl for three. 1969: Second baseman Robert Fulewider is the school’s first major league draft pick, chosen by the St. Louis Cardinals. 1972: CLC finds coaching stability with Ron Stillwell, who is the first coach to win 100 games and compiles a 139-100-1 record in seven seasons. 1972: Right-hander Jeff Brock is drafted by the California Angels. 1976: CLC wins a then-record 28 games and Stillwell is named NAIA Coach of the Year. 1977: Catchers Gary Ledbetter and Steve Trumbauer are both drafted by MLB teams. Ledbetter, the earliest-ever pick out of Cal Lutheran, is selected in the first round (ninth overall) by the Giants while Trumbauer is drafted by the Angels. 1979: Jim Cratty coaches one year. 1980: The Al Schoenberger era begins. In eight seasons as coach, he has a record of 178-170-2. 1980: Kingsmen advance to postseason play for the first time. 1981: Right-hander Kevin Gross is drafted in the first round (11th overall) by the Philadelphia Phillies. The Fillmore native would become Ventura County’s first MLB All-Star in 1988 and pitch a no-hitter for the Los Angeles Dodgers in 1992. 1981: Lefty pitcher Mark Butler is a seventh-round draft choice of the Baltimore Orioles. 1981: Mark Butler and Tom Ginther become the first NAIA All-America selections, earning Second Team honors. 1982: Catcher John Westmoreland is a 15th-round pick by the San Diego Padres. 1983: Mark Bush is an NAIA Second Team All-America selection. 1985: Catcher Todd Dewey is drafted in the sixth round by the Atlanta Braves. 1988: Rich Hill replaces the retired Schoenberger. In only six seasons, Hill becomes CLU’s winningest coach to date with a record of 198-80. 1989: Shortstop Daren Cornell is a 12th-round draft pick by the Milwaukee Brewers. 1989: CLU tops the 30-win mark for the first time (31-18). 1990: In its last NAIA season, CLU wins the District 3 tournament out of the Golden State Athletic Conference and advances to the regionals in Portland, Oregon. 1990: Outfielder Blake Babki signs a free-agent contract with the New York Mets. 1991: Bob Farber is a CoSIDA Academic All-America 1991-92. 1992: Now in the Southern California Intercollegiate Athletic Conference and NCAA Division III, the Kingsmen are runners-up at the College World Series, losing to William Paterson (N.J.) 3-1. CLU wins a school-record 43 games. 1992: Four players earn ABCA All-America with two First Team selections Steve Dempsey and Darryl McMillin, Second Team Dan Smith and Third Team Pat Norville. 1993: CLU makes a second-straight World Series appearance, finishing seventh. 1993: Jeff Berman is a First Team ABCA All-America honoree. Joe Cascione, Eric Johnson and Mike Winslow named to Second Team. 1994: Marty Slimak becomes the 10th head coach. In 24 seasons, Slimak has a 688-323-8 record (.679) with a national championship, 13 NCAA West Regional appearances and 12 SCIAC titles. 1994: John Becker and Scott Sebbo are named to ABCA Third Team All-America. 1996: In its second trip to a Division III championship game, CLU falls again to William Paterson, 6-5. 1996: Andrew Barber pitches a no-hitter and is named to ABCA Third Team All-America. The right-hander signs a free-agent contract with the Colorado Rockies. 1997: Tom McGee earns ABCA Second Team All-America and Richard Bell is ABCA Third Team. McGee, a catcher, signs a free-agent contract with the Orioles. 1998: The Kingsmen finish seventh in the College World Series. 1998: Joseph Jauregui earns ABCA Third Team All-America. 1999: In a second consecutive CWS appearance, Cal Lutheran places third. 1999: Pitcher Adam Springston (34th round, Braves) is the fourth CLU player to be drafted in the ’90s, joining outfielder Darryl McMillin (60th round, Royals, ’92), right-hand pitcher Marc Weiss (26th round, Reds, ’94) and left-hand pitcher Richard Bell (28th round, Dodgers, ’97). 2000: A year after right-hander Tom Canale is ABCA Third Team All-America, he goes in the 10th round to the Cleveland Indians. 2003: Three-year starting pitcher Jason Hirsh is the first draft pick (2nd round) of the Houston Astros. The right-hander goes on to pitch three seasons in the majors. 2003: Catcher Taylor Slimak, the coach’s son, is drafted in the 23rd round by the Dodgers. 2005: Christian Hariot earns ABCA Second Team All-America. 2009: Second baseman David Iden is drafted in the 35th round by the Dodgers, capping a decade that saw a record eight CLU players drafted, including left-hand pitcher Justin Keeling (25th round, Twins, ’02), second baseman Brian Skaug (20th, Astros, ’03), right-hand pitcher Matt Hirsh (30th, Astros, ’05) and outfielder Lee Ellis (46th, Orioles, ’07). 2011: Nick Boggan earns ABCA Third Team All-America. 2013: CLU wins the first of five regular-season SCIAC titles (2013-17), along with four of the first five SCIAC postseason tournaments. This year, it leads Division III in batting average (.340), scoring (8.9 runs per game) and on-base percentage (.430). 2013: Jake Peterson earns ABCA First Team All-America and Aaron Roth earns ABCA Second Team All-America. 2014: Lefty pitcher Jake Petersen, the only two-time ABCA First Team All-America utility player, is the most recent Kingsmen draft pick (33rd round, Angels), joining right-hander Ian Durham (28th, Phillies, ’11) and second baseman Garrett Smith (37th, Indians, ’13). In all, 24 Kingsmen have been drafted by MLB teams. 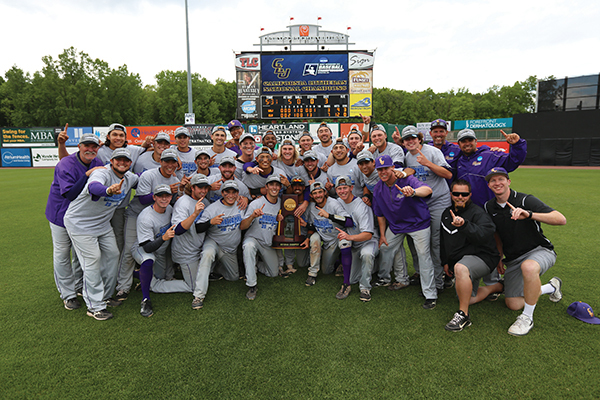 2017: Cal Lutheran wins its first national championship, defeating Washington & Jefferson (Pennsylvania), two games to one, in the NCAA Division III College World Series in Appleton, Wisconsin.